I wanted to have a toothpaste that was fluoride free and safe for both my mouth and my body. I believe I found it! I use this Healthy Mouth Tartar Control & Antiplaque Toothpaste (Fluoride-Free) Tea Tree Oil & Cinnamon by Jason Natural Products twice a day and am very satisfied. Keep your whole mouth healthy‚ without harsh abrasives or irritating chemicals. 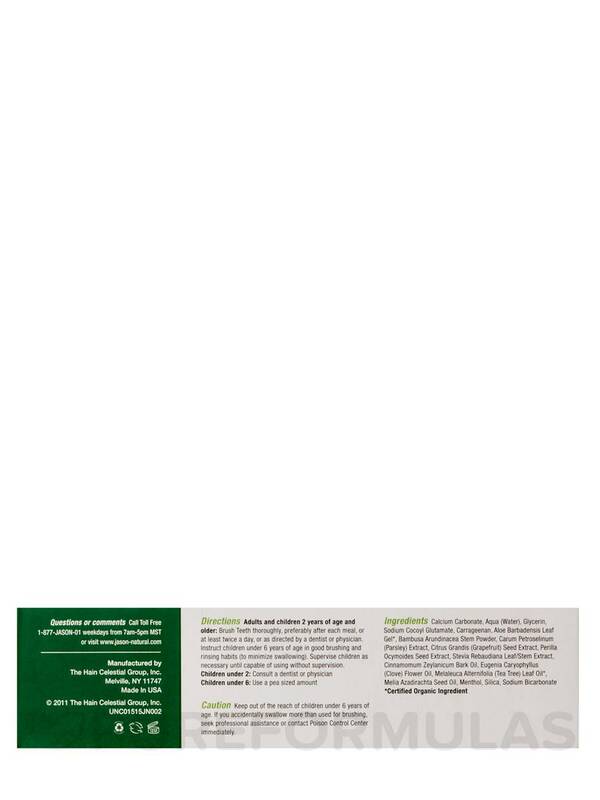 HealthyMouth® All Natural Toothpaste guards your teeth and gums from sugar acids and tooth decay. Tea Tree Oil‚ a well-known antimicrobial and antiseptic agent‚ helps defend the entire oral cavity from the bacterial growth that could lead to periodontal disease. Natural Grapefruit Seed and Perilla Seed Extracts help reduce tartar build-up while Aloe Vera Gel soothes gum irritation. A refreshing Cinnamon chill keeps your breath fresh all day. For a healthy smile and fresh breath‚ use JASON HealthyMouth® toothpaste and mouthwash twice a day. - No Sodium Lauryl/Laureth Sulfates. Calcium Carbonate‚ Aqua (Water)‚ Glycerin‚ Sodium Cocoyl Glutamate‚ Carrageenan‚Aloe Barbadensis Leaf Juice (1)‚ Bambusa Arundinacea Stem Powder‚ Carum Petroselinum (Parsley) Extract ‚ Citrus Grandis (Grapefruit) Seed Extract‚ Perilla Ocymoides Seed Extract‚ Stevia Rebaudiana Leaf/Stem Extract ‚ Cinnamomum Zeylanicum Bark Oil Eugenia Caryophyllus (Clove) Flower Oil‚ Melaleuca Alternifolia (Tea Tree) Leaf Oil (1)‚ Melia Azadirachta Seed Oil‚ Menthol‚ Silica‚ Sodium Bicarbonate. Brush Teeth thoroughly‚ preferably after each meal‚ or at least twice a day‚ or as directed by a dentist or physician. Instruct children under 6 years of age in good brushing and rinsing habits (to minimize swallowing). Supervise children as necessary until capable of using without supervision. I love Healthy Mouth Tartar Control & Antiplaque Toothpaste by Jason Natural Products, it's mint-free and fluoride-free and a little bit goes a long way for a super foamy brush! Helps keep my teeth very white and has a fairly mild taste, nothing overpowering. This is my go-to toothpaste and I can't find it in stores so I always order it from Pure Formulas. I just recently purchased this Healthy Mouth Tartar Control & Antiplaque Toothpaste Tea Tree Oil & Cinnamon by Jason Natural Products. I can honestly say it is the best toothpaste I have ever purchased. My teeth feel silky smooth and clean. The taste is awesome. I could have sworn the last time I ordered Healthy Mouth Tartar Control & Antiplaque Toothpaste Tea Tree Oil & Cinnamon by Jason Natural Products the tube was bigger, quite bigger. Now its much smaller and the price is still the same. Disappointing but I will still order nonetheless. The second toothpaste I found that gives me a noticeable difference in the feel and appearance of my teeth. The taste and even the quality seem to be good, but I personally won't be using Healthy Mouth Tartar Control & Antiplaque Toothpaste (Fluoride Free) Tea Tree Oil & Cinnamon by Jason Natural Products anymore as it has carageen in it and that's an unsafe chemical/ingredient. I don't like that's unclean and still full of unsafe and harsh chemicals. Tastes good and gives results as advert. 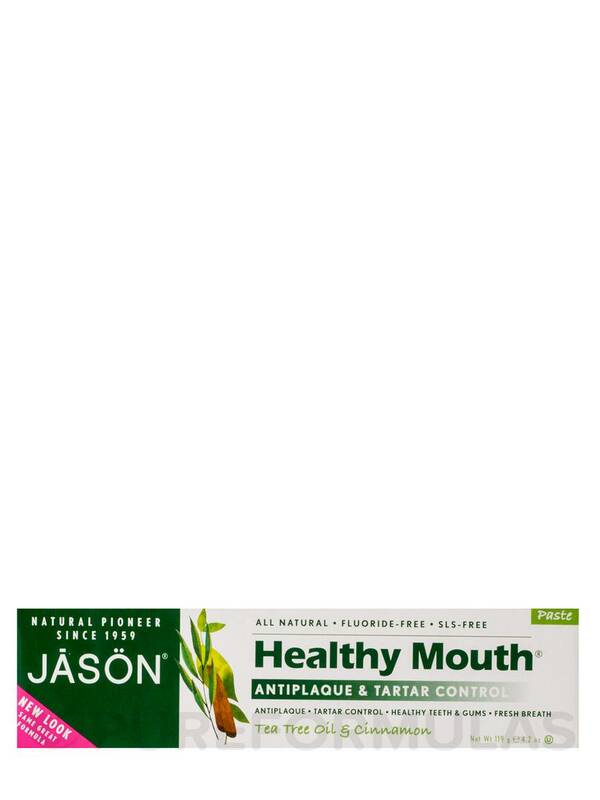 Healthy Mouth Tartar Control & Antiplaque Toothpaste by Jason Natural Product is fantastic! So happy it's fluoride-free and has no artificial sweeteners! It's slightly thick, but foams up very well while brushing. I use both an electric and a manual toothbrush and it's fine on both. A little tingly, but good! Fluoride free, no artificial sweeteners! 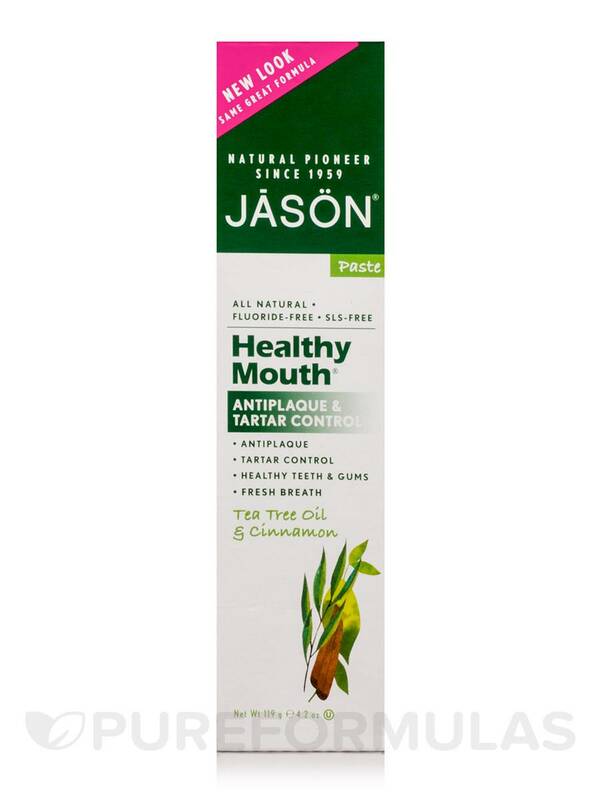 This Healthy Mouth Tartar Control & Antiplaque Toothpaste (Flouride-Free) Tea Tree Oil & Cinnamon by Jason Natural Products is very good. It is fluoride free with tea tree oil (wonderful addition) and it offers a quality cleaning power. Very satisfied! 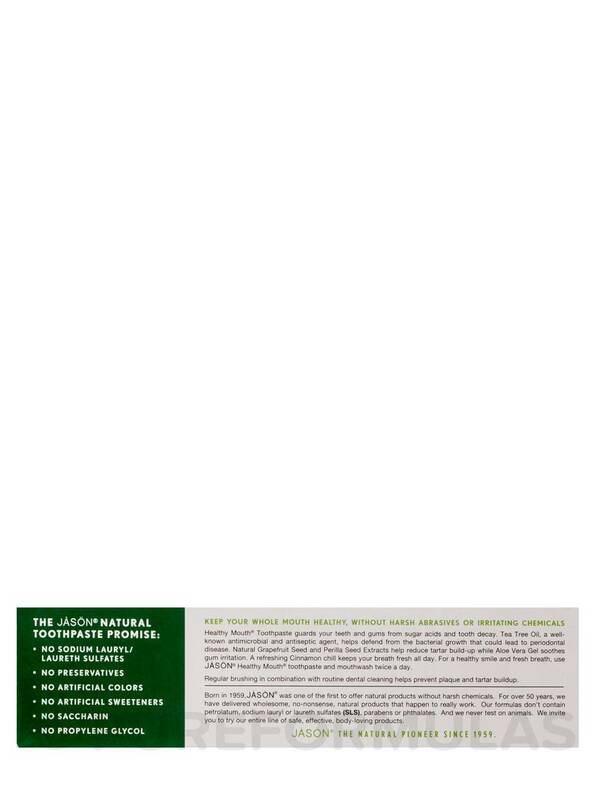 I won't buy Healthy Mouth Tartar Control & Antiplaque Toothpaste by Jason Natural Products because it has carrageenan in it, which is toxic. Great product that tastes great as well! The taste. Vegan company. Not tested on animals. Natural ingredients. 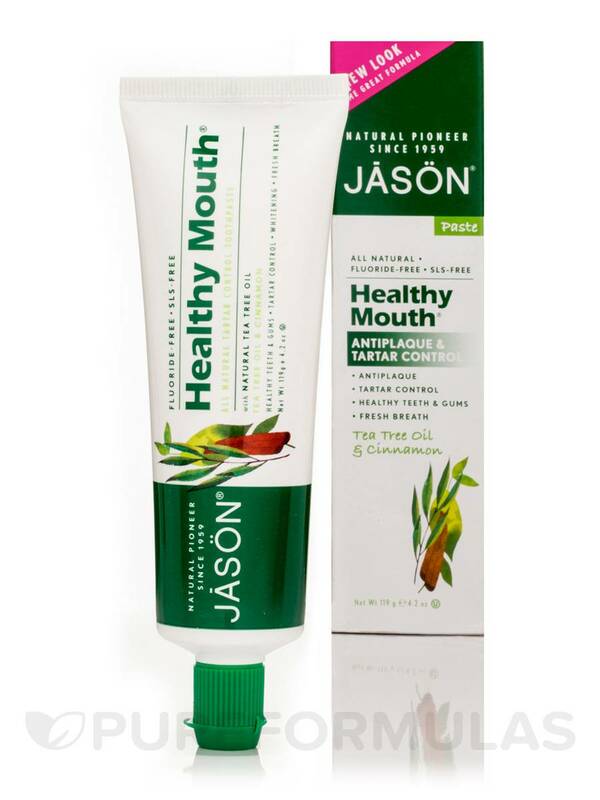 I love Healthy Mouth by Jason Natural Product! This toothpaste is a great fluoride-free toothpaste with tea tree oil and cinnamon. It cleans and foams well. I like the organic tea tree oil, cinnamon and clove. Fortunately, this currently doesn't contain xylitol - sugar alcohol irritates my teeth. Most importantly, it has no fluoride!